In the early summer of 1885 in England there was a "Great Kent March" by Salvation Army Officer-cadets. They were known as "Life Guards" and the march was headed by a band of 25 brass instrumentalists, each wearing a white pith military helmet( the normal military headgear of the day), a red Guernsey, blue trousers and gaiters and carrying a knapsack and water bottle. Later it was suggested that a permanent band might be established. A War Cry advertisement called for volunteers: " If you're young, if you're saved, if you're physically fit, if you can play a brass instrument... „are prepared to leave home and family for six months active service for God and the Army. ...then be at Clapton Congress Hall on 12th March 1887." The Household Troops Band was formed with Staff- Captain Harry Appleby as bandmaster. No salary was offered and no guarantee was given apart from food and clothing. On June 1st, 1887 the pioneer 25 members of the Household Troops Band left Clapton Congress Hall to march into Salvation Army history. Their first tour lasted 8 months. The next year, in October, the band left for Canada as the first British Salvation Army band to cross the Atlantic. This visit was an outstanding success as from October 1888 to February 1889 they campaigned daily in towns throughout Eastern Canada from as far west as Windsor, Ontario and as far east as Halifax, Nova Scotia, before leaving St. Stephen, NB to tour the United States. General Arnold Brown in his book "The History Of The Salvation Army In Canada wrote: " ...it was the impact of the English Household Troops Band which, more than any other event in this period, aroused the musical consciousness of Salvationists in Canada." Shortly after the Band returned to England, Territorial Headquarters at the direction of the then Territorial Commander, Commissioner T.B. Coombs initiated the formation of a Canadian 'Household Troops' band, which was comprised mostly of teenage boys, some of whom were sons of Salvation Army officers stationed at Territorial Headquarters. Corps Bands now began to show up at many centres and flourish. The May 4, 1889. issue of The War Cry commenced a column devoted entirely to the interests of Bandsmen. It was obvious that Salvation Army banding was here to stay. 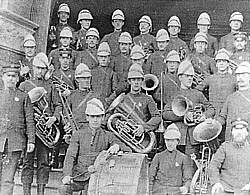 An early print of the Riverside (Toronto V) Band - incidentally the first Band in Canada to introduce female members into its ranks - shows the corps' two girl officers with a group that included four comet players, three tenor horn players, and other instrumentalists playing baritones, euphonium, trombone, and circular bass. Your Editor has had the pleasure of knowing Ken for many years and he has already established himself as a tenacious historian of the Salvation Army, with a keen eye for detail and a determination to follow a story wherever it may lead. When Ken asked me to read and edit the manuscript for this book, I was astonished by the story and realised that it needed to be brought to as wide an audience as possible. Ken was born in Coventry and is a fourth-generation Salvationist. Eliza Shirley also hailed from Coventry. 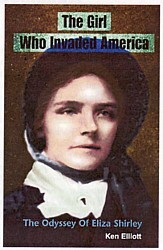 She left England in 1879 with her mother Annie and travelled to America, settling in the then rather rough Philadelphia. Although without the official sanction of Headquarters, the family began to prepare an abandoned factory for meetings. Few people attended at first and the civic authorities were certainly opposed to their efforts. However, the family's integrity and hardwork won through and Ken's book follows Eliza through her many triumphs and tribulations. Indeed, this book is illuminating in so many ways. It certainly shows the intensity of the family, their belief in William Booth and the Salvation Army, the way in which the Army used their services and the cost to those early day saints. Seven months after Eliza landed, George Scott Railton and the 'Hallelujah Lassies' arrived in New York. As they came with the authority of William Booth, they are officially credited with starting the Army in the USA. However, it was clearly the Shirleys who brought the work to America and this book makes that clear. Ken writes in the increasingly popular 'factional' genre — a mixture of the facts and fictional narrative between the characters. This style makes the book incredibly readable and I wholeheartedly recommend it to all our readers. It is a great success for Ken and indirectly, the SAHPA. One of the reasons for the existence of the SAHPA is to promote historical work and we have in past years reprinted sometimes substantial booklets. This book was to be the SAHPA's first major publishing venture. Shortly before going to press, we were asked by the Salvation Army in America to allow them to publish the work. This we were glad to do, especially as the Army has significantly more outlets than we were able to reach. We have thus allowed them the copyright to the book. Various of our members have written pieces or books and we are currently looking at an excellent family history going back to the earliest days of the Army. If you have anything to write, short or long, please do get in touch. Many members will know that my mother was Promoted to Glory earlier this year, shortly before her 90th birthday. She loved the Army and its rich heritage, and was a tireless worker to further the Kingdom. Charlotte was born in Ilfracombe, North Devon and as a youngster, although being bought up in the local orphanage, attended the local Corps. Ilfracombe had a flourishing band and one of mother’s earliest Salvation Army memories was in the Hall on a Sunday evening, mid-way through the band playing a march, hearing the maroons going off summoning the lifeboat crew. Several members of the Band put down their instruments and ran out of the Hall to the lifeboat station to man the lifeboat. This happened on a number of occasions. She also remembered standing on ‘Preacher’s Rock’, which is just on one side of the beach, giving her testimony, as well as ‘singing to the fishes’ as the Young People called it. There was a favourite tourist walk between the harbour and a central beach which involved paths around a large hill (called Capstone). There were benches and shelters along the way and many people also sat on the grass looking out towards Wales. The Salvation Army held open airs along there but sometimes few people were in evidence, hence, ‘singing to the fishes’. An active member of the Corps, Charlotte moved to Exeter aged 15, first as a domestic servant and then employed at the University. She soldiered at Exeter Corps. When World War Two was declared in 1939, she became a Candidate Helper with the Salvation Army’s Red Shield and served on military bases at St. Austell, Falmouth, Halton and Andover. It was at RAF Halton that she learnt to drive the mobile canteens so beloved of ground and air-crew although upon leaving Halton, she never drove again. During the latter stages of the war Charlotte returned to Ilfracombe where she was Sunbeam Leader in the still thriving Corps. She then entered the William Booth Memorial Training College as a cadet in the 1945/46 ‘Challenger’s’ Session. From there she was commissioned with appointments in the East Anglia Division. Her Corps included Sudbury, Linton and West Wycombe, Braintree, Mashbury and Norton. Even in those days life was hard for Salvationist officers in the front line. As second in charge in her early officership, mother would cycle miles between Corps to hold meetings, lodging in very basic accommodation when the Army had no quarters and sometimes going hungry because the Corps did not have enough money left after paying its dues to Headquarters and its bills. She remembered being grateful for the occasional fish and chip suppers left on the doorstep by fiends. It is perhaps hard to think today that this self-sacrificing vocational sense of duty was barely fifty years ago but such dedication reflected how the Army was built and thrived. During the mid-1950’s she resigned her commission owing to ill-health and moved to Cambridge where she worked for Marks and Spencer. While on holiday in Ilfracombe she met Kenneth who was an engineer for the Cementation Company. He specialized in water engineering/damns. Ken had also been brought up in an orphanage (in Rochdale). They married on 2nd April 1955 at the Salvation Army’s Corps in Cambridge. In 1959 their son Glenn was born. They remained in Cambridge although the family attended the Histon Corps which was easier to get to. Charlotte devoted her time to the home and to voluntary work. Ken worked away as a civil engineer but later joined the Post Office. Upon Ken’s retirement they fulfilled their long-cherished dream to return to Ilfracombe. They worshiped at Ilfracombe Corps and in March 1992 Charlotte (then 71) was commissioned as a member of the Band in which she played the tenor horn. She took on various roles within the Corps and in voluntary work throughout the town. Sadly Ken died 12 years ago but is fondly remembered for his many activities in the Town. Charlotte had, and has passed on to Glenn, a deep interest in all aspects of the history of the Army with the result that part of her home was given up as a museum. Large numbers of visitors have been blessed whilst viewing the treasures of yesteryear and Charlotte was always ready to tell the Army’s story to those she met. In 1989 she produced a book giving a fascinating account of the Army’s history through pictures from her collection. In addition to the many postage stamps which concern The Salvation Army, there is a great host of items which have been issued by or on behalf of the SA, and Which are connected in some way with the post. It is hoped that each issue of this Newsletter will bring to readers some of these cinderellas, often very rare, but always of interest. We commence with the Young People's Cartridge Stamps. Over seventy years ago, the Young People's Work (more often known as "Juniors" or "Sunday School") section of the S.A. issued a series of labels depipting various aspects of the life of General William Booth, the Founder of The Salvation Army, and showing some of the Army's work in many lands. These "stamps" were given to children Who attended each week, and paid a "cartridge" (personal.offering) of at least a halfpenny a week. A small book was supplied to each attender, and a stamp issued each month. The book contained little descriptive material, and included spaces in which to stick stamps. So far as can be established, there were 36 different stamps, each with a descriptive caption, and it is believed that the scheme- started in January 1919. None of these stamps were nuebered, and they bore a very strong resemblance to the Turkish postage pictorials of 1914. All the issues so far seen by the writer are on medium wove paper, a little toned, and without watermark. The perforations vary between 13 and 13. Fifteen different. have been noted; a list is not given here, as members are sure to possess some of these, and a complete list should not be too difficult to compile. Members are requested to report details of those specimens Which they possess, so that the knowledge may be more widely disseminated. In 1922, a new book.was issued. Books examined bear commencing dates of January 1923 and 1924, but they could have been issued late; it is very likely that not all Corps took up the system at its inception. Whereas the first book had comparatively plain covers, those of the new book were beautifully coloured, in a design which was much in advance of its time. The covers are of stiff card, edged in pale blue, with a dark blue cloth spine. The design on the front is lithographed in multicolour showing the Army Flag and tasselled ropes, with a vignette showing Jesus and children. The book is entitled "THE SALVATION ARMY" in three lines within a scroll, and "YOUNG PEOPLE'S CARTRIDGE STAMP ALBUM" in three lines on a salver-shaped scroll. At the foot, on a further scroll, is "The Fear of GOD is the beginning of wisdom". Inside the front cover are details of the issuance of the book; it is described as (No.1), but is the 2nd edition! Perhaps it was intended to continue the series at a later dated. Inside the back cover, in two lines' is "Made and Printed in Great Britain by The Cempfield Press, St. Albans." This is the Army's own printing establishment. There are 12 pages within, with much detailed descriptive matter, being a history of General Booth and the S.A. to 1913, together with spaces for 36 stamps. The stamps are numbered, but without captions. The design measurei 23x35mm; 15 designs are horizontal, 21 vertical. The paper.is similar to the previous issue, soft white wove, with cream gum arabic on reverse. Perforations all seem to be 13, but these should be very carefully checked. It has not yet been noted who designed or printed the stamps, nor the size or format of the sheets. The designs all have black vignettes, except for no.8, which is yellow, red and blue an a pale yellow wash (these are the colours of the Army flag). All are numbered in black, except for no. 8 (red), 15 (colourless with a'black outline), and 30 (colourless on a black background). The Salvation Army opened fire in Portuguese East Africa in 1916. As in other countries this was a case of Salvationists seeding themselves. It would appear that young Africans returning from working in the Transvaal Gold mines, having been converted and become Salvationists, ‘Opened Fire’. Envoy Petros Nhampose is credited with this action, commencing the work in the Inhambane province. From here the work gradually spread south and also up to Masinga, fifty miles to the north. The work was to say the least difficult, especially due to persecution by the Roman Catholic authorities. It would seem that many of these early Salvationists had found Christ under the ministry of Adjutant Tom Maqili’s compound work from 1911 onwards. Beyond this nothing is really known about Salvation Army origins in Portuguese East Africa; but it is known that Maqili visited the districts over a three month period in mid 1917, counseling the converts that had been made. In 1918 Brigadier Fred Clark visited the authorities, having first obtained a letter of introduction from the British Consul General, countersigned by the Acting Governor of Mozambique Province. His tour commenced in September 1918, and during his tour he found Salvationists at Inhambane, Nhampose and Inharrime. Brigadier Fred Clark was followed everywhere he went as he was considered to be a foreign spy. The Salvation Army Year Book for 1920 records, ‘Urgent Appeals are made to us for the extension of our work in Portuguese East Africa’ These appeals were presumably received by Territorial Headquarters in South Africa for Commissioner William Eadie advised that the appeals came from the provinces of Inhambane, Gazaland and Tshopiland. It would seem that the necessary finance was available, but personnel was another matter, particularly in speaking Portuguese and French. In March 1919 General Bramwell Booth approved the opening of Salvation Army work in Mozambique. So it was in July 1920 that Ensign and Mrs. Edwin Skotnes arrived in South Africa to ‘officially’ pioneer this work, Skotnes was an experienced missionary officer. A short time later it was reported that Skotnes, with Adjutant Tom Maqili, Ensign William Mhlotswa and Pro-Lieutenant Duwe were making good progress on their tour of the country. However Skotnes was recalled to South Africa in April 1922; a government stipulation required that there should be a European officer residing in the province who could speak Portuguese; and the government was totally unwilling to recognize the Army. However Mozambican Salvationists were still travelling to Johannesburg to work in the mines, reporting that they were preaching faithfully, but meeting with opposition from the authorities, some had been imprisoned and others given warnings. The War Cry 10th June 1922 carried this statement from one of them ‘I am going back to preach Jesus in The Salvation Army, prison or no prison, for when a man is born again in The Salvation Army, how can he live as ordinary Christian’ The following year Mozambique became a separate Salvation Army command under Brigadier Charles Soul, the Divisional Commander for the Central Division. So it was that Maqili was promoted to Staff-Captain on 1st April 1926 and appointed to Gazaland, the district where he was born, and in November 1926, the Christoffersons were withdrawn. At the same time Captain Khoza was sent from South Africa to Papu in the Panda District inland from Inhambane, and Lieutenant Nhayombe was sent to work in Gazaland. However he was apprehended by the local government and set to work road making. The problems being that he was not able to justify his living in the area without working the land, and it was forbidden for others to pay his salary as his work as a preacher was not recognized by the authorities. On 17th November the Chief Secretary informed Maqili that he was now in charge of the work in Mozambique. On one tour he walked for a 150 miles, and conducted 24 meetings. The following year Staff-Captain Christopher Salmons and Captain Christofferson returned to the country, and established Chilbelana Corps in the Magude district. From April 1928 the Mozambique District was united with the Central Division and by this time there were 3 Corps, 11 Societies and 250 soldiers. During the next three years a further 32 Corps had been added. The first corps flag was presented to Chilbelana Corps. •That the activities of religious missions should be strictly supervised and regulated. •That no foreign school of religious propaganda or of elementary education would be able to establish itself in the Colony without prior permission from the Administrative Authority of the country. •That an application indicating the religious ideas it wished to propagate and the locality in which it wished to work must be submitted to the Governor General. •That the schools be autonomous and leaders be responsible for any transgression. •That the locality of operation be designated by the Authority, no more than one licence to be allowed in any one area of a radius of ten kilometres. •That is it forbidden to preach outside the school building. •To enrol pupils of less then seven or more than fourteen years of age was forbidden. •To influence pupils to attend, to adopt instruction books not approved beforehand, or to teach or preach in any language other than Portuguese or the language of that country was prohibited. •That no native teachers could be employed unless they had successfully completed the necessary examinations. The work however did continue at local level, under the leadership of the indefatigable Major Thomas Maqili, but in 1932 there was an incident which served to remind everyone of the danger of working in Mozambique. Staff Captain Andersen had just returned from the country when he was struck down with cerebral malaria, and within a very short time was promoted to Glory at the age of thirty six. Reports did continue to filter through to Territorial Headquarters about progress in Mozambique, but also came accounts of continued opposition. Maqili also trained others to be officers, and often he would advise an Envoy or a Corps Assistant that he would be arriving on the Sunday when three meetings would be held, his work also included pioneering and administration. He would from time to time gather local officers together for a day of teaching and on certain days all the corps and societies in a certain area would combine for instruction. For the period 1934-1939 there is a silence in The Salvation Army’s records for Mozambique, there are no War Cry reports, and nothing in the files. What is known is that opposition increased during this time but the details are completely unknown. The fact that The Salvation Army is alive in Mozambique today is because during these years, officers and soldiers remained faithful to God and to the Army. Throughout its history in Mozambique, The Salvation Army has been largely maintained through the extremely dedicated service of local Salvationists, though there were times when an officer was appointed. Visits would also be made by Divisional Commanders from the Central Division and by succeeding missionary secretaries, which did bring a measure of organization to the work. Restrictions were commonplace, Salvationists being imprisoned without compunction and uniforms forbidden, as was the beating of The Salvation Army drum. Bank drafts were refused encashment, so that much needed finance could not get through. Some times the threats were thinly veiled: The Army could go into restricted areas without permission, but as one acting governor put it, ‘…I would not advise you do so. I am sure that would prejudice your application (to interview the Governor General of Mozambique), and there would also be consequences for your people’ Heaven alone records what the Salvationists endured. In 1942 Territorial Headquarters in Johannesburg received a letter from Maqili stating that the Administrator of the Magude District wanted to meet with a responsible European officer from Headquarters. In addition to this there was some concern as statistical and financial returns had not been received for some time. As a result of this the Financial Secretary Brigadier William Wotton and Major Harold Skjoldhammer, the Assistant to the Chief Secretary made the journey. It was war time and after a ninety minute wait at the border they finally did cross into Mozambique, only to find that petrol rationing had begun that very day, but with the assistance of the South African Vice-Consul they were able to secure enough for the journey. They met up with Maqili and the next day continued the journey. At Mbuyeni they were met by a march of over one hundred and fifty people and proceeded to the wattle and daub hall where five soldiers were enrolled. A survey conducted in the village found that sixty five per cent of the Salvationists there had direct contact with Army work on the Johannesburg mines, through husbands, brothers and fathers. At Chibelane four new soldiers were enrolled. Maqili at this time was being assisted by Envoy and Mrs. Matimbe whom he was training, and following the meeting, they along with Maqili, Lieutenant Litsuri sat down with the visitors for an inspection and audit which lasted well into the night. It was discovered that with Maqili’s advancing age, he was finding the administrative responsibilities and the command of Mozambique impossible. Some Corps had sent in reports, others had not, and it had proved impossible for him to complete the forms, also postal services were very difficult and this meant that letters just did not arrive. Some Corps were being run by people who had little or no administrative training and Maqili with his love for evangelism and pioneering was clearly not the man to teach them that particular aspect of Army responsibility. The situation was similar with inflation as it had been impossible to keep up with the payments to the Envoys in the more distant corps; and some had worked for months without salary. Litsuri reported that at times they had been so hungry that they were forced to eat wild fruit and drink water, it was clear that the grants to Mozambique were inadequate and that Maqili required help in organising the region. Their visit to the Administrator at Magude did prove valuable. They were received kindly and graciously, and they were able to explain the work of the Army, and its hopes for involvement in the area. However they were informed that official sanction would be required to continue working among the native people of the colony. There was a Roman Catholic school within three hundred yards of Maqili’s quarters and they had objected to the presence of the Army. He was to repair his buildings, refrain from using the bell to call people to worship and all children had to attend the Catholic school. This though did not deter the Army from once again attempting to send a European officer into Mozambique and continue the work. The authorities rejected the demand and stated that existing work would be suppressed unless a permit was obtained, but the conditions that were laid down for this were impossible to meet – the erection of stone buildings and Portuguese education for teachers and Envoys. Yet in spite of this opposition the work continued to grow, and in October 1943 three cadets from Mozambique were welcomed at the Fred Clark College in Soweto. It was also during this year that the Territorial Commander – Lieutenant Commissioner Henry Bowyer, accompanied by Major Harold Skjoldhammer visited Mozambique by car. Arriving near Nhakutove late one evening after travelling for miles along a dusty track, they saw Salvationists marching towards them beating drums and waving flags. The car was surrounded and the Commissioner and his party alighted and made their way to the village. The next morning the Commissioner dedicated a new hall, and during the meeting sixteen senior soldiers and five junior soldiers were enrolled. They continued the journey towards the central corps in the Zavala region, Makulube West, but the road was difficult and they were often stuck in shifting sand, and they spent the night in the home of Chief Phillip Makulube before attempting to resume the journey the next morning. However the roads proved too much for the car and eighteen miles short of their destination they could go no further. A runner was sent to break the news to the corps that the Commissioner could not arrive, and immediately the Sergeant Major organised a march, determined that nothing should prevent them from hearing the Commissioner. Late that night the visitors heard the beating of drums and saw an army of several hundred singing Salvationists march into the clearing. The women had mats, cooking utensils and food on their heads, and babies on their backs. A great campfire was built, lanterns hung in the trees and the meeting was soon under way. A visit from headquarters was not to be missed at any price. The next morning another meeting was held in which thirty one senior soldiers and six junior soldiers were enrolled, seven local officers commissioned and thirteen babies dedicated. The car was then repacked and to make it lighter many of the soldiers carried some of the luggage on their heads. Once they reached a good road the car was fully loaded and the journey continued to Zavala, where they were warmly greeted by the Administrator. However this would seem to be the exception rather than the rule, for in 1945 the Chief Secretary, Colonel William P. Sansom forwarded a copy of a letter to International Headquarters in the absence of the Territorial Commander Lieutenant Commissioner Geo Bowyer. The letter had been received from Lieutenant P. Matimbe, the recently appointed Commanding Officer of the Inhambane Section and is addressed to Major Skjoldhammer. The letter speaks for itself, ‘I am writing you with regard to our work here in Portuguese East Africa at the Nhamachacha Corps. Great difficulties and trials have come upon us here in our land. I am writing to let you know that I went to Nhamachacha because I heard of difficulties there. At first I went to see the Administrator of Homeoine. Now the Administrator gave me a letter to go there. I went to the Chef de Post who read the letter and then said, “Well, have you any work here? I answered “Yes we have” He said to me, “Who is in charge of the Army’s work at Nhamachacha?” I said, “Envoy Andrew Nhamposse” He then said to me, “He must go back to his home at Homeoine where he comes from because you have no work here. There are two churches here already who have permits to work in this district” Then as he spoke he opened the book of the country and pointed to a page and said, “Where is the work of The Salvation Army? It is not registered. Go away and don’t go to Nhamachacha because you have no right to work there at Nhamachacha” I said, “I understand. But now, as the Administrator has given me this letter to go and preach at Nhamachacha, then you, Chef de Post, must allow me to go there” He said, “No, I refuse. Go back to your home”. In his covering letter the Chief Secretary writes of the close attention given to the work in Mozambique over the previous three years, by means of annual visits and careful instruction to the Envoys. He expresses his concern very strongly concerning the breakdown of the arrangements for the appointment of Adjutant Steinmetz, and also of the fact that they were unable to get Adjutant Martinez from the U.S.A. He goes on to state that they were not permitted to appoint Major George Tabor or some other competent European Officer, who could use influence at Lourenco Marques and watch the Army’s interests in high circles. He then states that up to the present the Army has failed to secure permission to work in the Colony, and that at any time the work could be closed down in every district, notwithstanding the fact that we have large forces of African Salvationists there. He reports that he will shortly be visiting Mozambique again, and that all the District Administrators will be visited and that no doubt they would be received very cordially by them; but the truth being that in reality they are all thoroughly scared of the Roman Catholic Church, and the possibility of losing their jobs or even their lives. By 1947 the opposition of the Government seemed to be less stringently enforced and a visit by the Territorial Commander became an annual event, Lieutenant Commissioner William Ebbs made at least three tours of the country, and writes a very optimistic report in September 1950 to the International Secretary for Africa – Commissioner A. Moffatt. By 1950 the total soldiery numbered 730 but numbers attending meetings were much greater. Envoy Andreas Nhampossa had been instructed by the priest that as his own church was dead, they must all become Catholics, but he replied that in no way would they be disloyal to the Army. He assured Lieutenant Colonel Usher that no one had left the Army in spite of the fact that there had been no contact with Headquarters for eight years. Many of the lay Salvationists from the 1950’s and 1960’s remain unsung and unhonoured, some are still unknown to this day. They often went without financial support for years at a time. In the late 1960’s church bodies were advised to register, and this resulted in Captains Malinga and Makakule being sent to help Major David Litsuri at Mbuyeni, but their travelling documents were seized and only with great difficulty were they brought back to South Africa. The main problem was finding a leader for the work as the stipulation was that the leader must be a Portuguese national, Portuguese speaking Brazilians were unacceptable to the government. The possibility of appointing Major William Langa as an associate was not followed through, Langa was a Shanaan who had trained as an officer in South Africa. This suggestion was not accepted and persecution continued, uniforms and song books were buried in the sand, songs were learned by heart and many remained faithful. In 1967 Brigadier Litsuri was able to register the Army in the Inhambane district and in the same year came reports of young people offering for officership, but in other areas the persecution continued. Though during this period there were persistent attempts to register the Army. In 1970 the Territorial Commander Lieutenant Commissioner Fred Griffin, along with Lieutenant Colonel and Mrs. Victor Milne visited the country. Colonel Milne on returning pointed out that the name of the Army in Portuguese ‘Exercito’ could give the impression of violence and fighting. Mozambique was now involved with a civil war. Some effort was made to find a piece of land which could be purchased in the name of the officer in charge Major Litsuri, and with the ownership of the land there would be base from which to apply for recognition, a piece of land was found in the Capital but the application was turned down by International Headquarters. In 1971 a further attempt was made to see the Governor General, but beforehand there was a great deal of deliberation to make sure that the wording of the application was correct. Other missions though they were suffering were allowed to work in the Colony, but yet again the Army’s military type of organisation caused suspicion. Great care was needed to ensure that it was presented as no threat to the government, but as a peace loving and peace promoting church. Lieutenant Colonel Milne visited many officials including the Portuguese Consul in Johannesburg and the South African Consul in Mozambique. It all came to nothing as the Governor General was in Portugal and the suggestion was made that the application again be made through the Portuguese authorities in South Africa, with an outline of the Army’s work, teaching and constitution. At the same time Lieutenant Colonel Milne met with the Anglican Bishop in Mozambique regarding the Army receiving recognition. Though the Anglicans had been operating in Mozambique for 80 years they still had no permission to purchase land. There had been some talk of obtaining five hundred signatures to a letter requesting that the Army be permitted to operate in Mozambique. However the Bishop who was also an advocate was able to clarify the situation. This style of application had to be made by adults, giving full name, address, identification number, occupation, denomination and they must also have reached a certain standard of education; it was clear that this approach would not be possible. The Bishop further explained that the government had to feel that the doctrines were acceptable to them, that the religion was ‘lawful’ and that the operation of that denomination would in no way endanger the constitutional order. Again the army’s military organisation would be a problem. The Bishop advised waiting until the Portuguese had more tolerance in their own country as the Army was not accepted yet, there. The Year book for 1974 reported, ‘This year has seen a tremendous breakthrough in Army work in Mozambique, where official permission was given to hold meetings at Inhambane. A contingent from the nearby Roman Catholic Church came to a meeting where 500 gathered, bringing greetings to The Salvation Army and a thank offering of 50 Escudos. Seventy soldiers were also enrolled. A shed has been erected on the site near Lourenco Marques where cement will be stored for the erection of a hall and quarters, when the site has been registered. A District Officer has been appointed with headquarters at Kongaloti near the capital. Major Roderick Malinga D.O.’ It was to be another false dawn, and Major Roderick Malinga had to return to South Africa. However in 1974 during the War of Independence Major and Mrs. Malinga were able to again make their way to Lourenco Marques and they described the situation as something like doomsday. They were only to leave the country after many dangers. Again in 1975 Major and Mrs. Malinga were able to enter the country and they were able to hold extremely well attended meetings at several corps. The people were pleading for second hand uniforms, tambourines and song books. They had been faithful through so much opposition that nothing – not even the revolution was going to stop them now. It seemed that the new independent African Government did not seem to be opposed to the Army holding meetings and though there was danger from political fighting, the religious opposition was far less. Although some of the older Envoys had been promoted to Glory, others were continuing in spite of their age and infirmity, even though their salaries were not getting through. Again there was a cry for an officer to live in Mozambique and be responsible for the work. The Year Book for 1976 reports, ‘Despite anxiety about the situation in Mozambique, Army work has not suffered there and new efforts are being made to secure full recognition’ After this there is again silence, as the war interrupted communications but the faithful soldiers continued to hold prayer meetings every day and Sunday Meetings, in spite of the danger that continued from the fighting factions on both sides. Though the Army was uninvolved with party politics, the uniform marked them out and some regarded them as a threat. By the early 1980’s a new era was beginning as age began to take its toll on the elderly envoys. In 1973 Maurico Macuacua was made a sergeant and in 1980 was made an envoy, he had joined the Army in 1971 after he had had moved to Maputo and his uncle who was a Salvationist had encouraged him to attend. By this time freedom of worship was a fact but Mozambique was still a very dangerous place. In 1982 Brigadier Manpone – the Assistant Field Secretary along with Major Makukule were able to make the first official visit in almost a decade, to conduct Easter Meetings and found the Army very much alive but the country was in a mess. However there still remained the problem that The Salvation Army was not registered, whilst other churches had already completed their registration and had been accepted. Whilst they were in Maputo they visited the government authorities, particularly the Methodist minister the Rev. S. Mahlalela – he was the Secretary representing the government in all church matters, and he explained that in order to be registered, the Army would need to deposit a sum of at least R100. Brigadier Mampone was able to report that Envoy Maurico Macuacua was making good progress and that he might be the one who could carry out the necessary negotiations with the government, he was also able to ratify Macuacua’s appointment as an envoy and give him his commission to conduct meetings in Maputo and visit the outlying corps. In order to do this he was supporting himself financially by working in a factory in Maputo – the apostle Paul must have been smiling. In 1984 Major Roderick Malinga was again able to enter Mozambique but was only able to visit Maputo due the activity of the resistance movement making travelling dangerous, but the Salvationists in the rural areas were still being visited by Envoy Macuacua. During this visit he was also able to visit the minister responsible for religious affairs, Rev Phillip Mbandze, who informed him that it was essential for the South African Salvation Army to recognise a Mozambique national as the leader of the Army in the county. So Envoy and Mrs. Macuacua were brought to Johannesburg for a short period of intensive training, commissioned as officers and made responsible for the work in Mozambique. The Minister for Religious Affairs had instructed Macuacua to take a census of the total Army membership in the country, and that each Salvationist was to carry an identity document. Out of their poverty the local Salvationists collected the R100 necessary to accompany the application for registration, so great was their desire to be recognised as a church. In late 1985 Major Malinga was able to visit Maputo where he met with Captain Macuacua who told him that the Army had been registered as a member of the Mozambican Church Council. To clarify whether the Army could be legally registered as well, they visited the Minister of Justice, whose deputy received them and assured them that there was no hindrance on their part, they were only waiting for the application. Major Malinga reported that much of the country was a war zone, that on the roads were hundreds of hungry soldiers begging for food, and that petrol prices were exorbitant. Then came the bolt from the blue, in March 1986 a letter arrived at Territorial Headquarters from Macuacua informing them that The Salvation Army had been registered as a religious body. All that was required was a form to be signed by an official at Territorial Headquarters and delivered to the Government. There was nothing to pay, a site had also been granted and all the army had to do was to take over the land and build. When the Field Secretary Lieutenant Colonel Charles Hall visited Maputo he was able to meet with Mr. Job Chambale, Director of Religious Affairs, who had had some contact with the Army as a refugee in Tanzania and Zimbabwe who declared, ‘This is the kind of Church we need in Mozambique’. Shortly after this Lieutenant Colonel Hall was able to hold congress meetings in Maputo to which Salvationist from all over the country gathered, he also presented a flag to Maputo Corps and on the Sunday hundreds of Salvationists marched behind the flag through the streets – the first Salvation Army march in Maputo. The Field Secretary was also informed that there were more than two thousand Salvationists at twenty six corps in Mozambique, and that one hundred and forty five soldiers had been enrolled and five outposts had opened in the last year. Although the Army was now registered there was still danger, mostly caused by the civil war, also the envoys and officers could not receive money. So it was arranged for Major Israel Lengoasa to fly into Maputo once a quarter to conduct meetings, share in fellowship and pay the allowances. In addition to this, financial help was given to Captain Macuacua for a feeding scheme he had commenced in the shanty towns where he was living – he had been funding this himself. In March 1987 the Territorial Commander Commissioner Stanley Walter visited Maputo but only three envoys were able to join him due to the difficulties and dangers in travelling. He learned that there had been a fifty per cent increase in the Soldiers Roll during the year. Also a flat was being offered for sale which was inspected and the question of the purchase of land was investigated. In addition the Commissioner learned that Captain Macuacua had been appointed chairman of the Refugee Committee and that he was serving in the region of five hundred three times a week to the poor in the shanty towns, and so it was organised that cooking utensils and food be provided. A few months later the Territorial Commander was able visit the country once again and many soldiers and envoys travelled for days through the war torn country to be present at the Congress in Maputo, and it was a very proud moment when six flags were presented to outlying corps – some of which had never had one before. The meeting was in fact shown on television, showing how far the Army had come in such a short time since official recognition. The flat in Maputo had been purchased, and Captain and Mrs. Macuacua had been able to move in, leaving their makeshift accommodation. All seemed set fair for the future, except for the constant danger to the work, caused by the civil war. Whilst persecution by the colonial government had caused hardship and imprisonment, the civil war began to take lives. Whilst returning home from the Congress – Envoy Joseph Nhampossa was killed in a military ambush. He was the first but by no means the last of the Mozambican martyrs. In early 1991 Captain and Mrs. Gerald Peacock were appointed to Mozambique as Regional Commanders, and they immediately set to work in organising the Army’s work within the country. Captain Peacock reported that the Army was very much alive but that it needed to be brought more in line with Salvation Army principles and practices. Poverty prevented many of the six thousand Salvationists from obtaining full uniform, but some attempt was made at regularising the uniform worn. He was also able to visit around the country, but continuing civil war made this dangerous. Also during this time, Lieutenant Colonel Christopher Parker, the Officer Commanding Portugal had visited Mozambique on a fact finding mission. He stressed that leadership in every way was a real problem, and that something had to be done to train local leadership and officers, so that the ever growing Army could be developed and consolidated. Many corps were being opened by people with very little knowledge of the Army; its methods and its doctrines and practices. In 1992 Commissioner Carl Eliasen from Brazil made a tour of Mozambique. Salvationists were thrilled to attend a Congress led by someone who spoke their own language. They flocked to Maputo by every means available. Commissioner Eliasen wrote, ‘The scars of dilapidation and civil war are to be seen all around. It is common to see crippled people (including little children) who have had their legs blown off by land mines. Thousand of refugees who flee from the war zones are attracted to the cities where they build make shift reed dwellings, and a severe drought has added despair to their existing sufferings’ The Commissioner was also able to visit Beira where a flag was presented to the five hundred and fifty strong corps, he also heard stories of the risks that the Salvationists faced. The Congress Meetings led by Commissioner and Mrs. Eliasen were inspiring and eighty seven year old Envoy Lucas Nhampossa proudly led scores of Salvationists in a march, singing, waving flags and playing tambourines. Within a week he was promoted to Glory, killed with others in an ambush. In 1993 there was a change of command with Major Israel Lengoasa being appointed as the Regional Officer. He had already established a good working relationship with the people and had begun to learn the language. In his reports he spoke of new corps such as Matola East where a sergeant major had heard of the Army whilst working in the mines and there were two hundred people he had attracted to the Army in his home area. At Beira a group of Christian friends approached the Army in Zimbabwe for leaders as they felt led to join the Army. They were visited and two hundred and seventy adults and sixty children were waiting, three outposts had already opened and there were rumours of others, and similar reports came from all over the country including Gaza where Major Maqili had worked forty years before. Although Envoy Nhampossa and others were gone, more took up the fight. The remaining elderly envoys continued faithfully and the army opened up in various parts of Maputo, with a short time there were three corps and nine outposts, and the feeding programme continued to grow. Slowly but surely the buildings at Bagamoio was taking shape, this was a large hall with houses for the Regional Commander and other officers. As the war gradually gave way to an uneasy peace it looked as if the Army could plan an opening ceremony. Invitations were sent to the President, Joachim Chissano, the South African Trade Mission, and various members of the Mozambican Government and churches. The Kwa Thema Band travelled from East Rand for the occasion along with the Territorial Commander – Commissioner and Mrs. Roy Olckers and several members of the Territorial Headquarters staff. Captain and Mrs. Macuacua now stationed in South Africa returned to Maputo as did several bus loads of Salvationists from the Inhambane area. The Maputo Songsters were on duty. Saturday 20th February 1993 was fine and hot and when the motor cycle out riders arrived, heralding the arrival of the President, the hearts of The Salvation Army soldiers present were full. Many of them had been singing and marching around the site for hours. The first brick built Salvation Army hall in Mozambique was about to be opened after more than seventy years of work and witness in the country. In speaking to the congregation which packed the newly opened hall the President gave his total support to the work and witness of The Salvation Army in Mozambique. He thanked the soldiers for their faithfulness and reminded them of their Christian duty to promote peace in their land. Brass instruments were also dedicated, gifts from the Kettering Corps in the United Kingdom. The weekend was also an opportunity to renew acquaintance with Mr. Job Chambale, Minister for Religious Affairs, who had for many years supported the Army’s work and encouraged its official recognition. Salvationists from Inhambane had brought a small tree to be planted in the grounds by the Territorial Commander, a sign of growth and life. They had also had a collection among themselves and brought a present of collecting baskets for the new hall. The Army in Inhambane had been operating for so much longer than in Maputo, but they wanted to express their love and joy for the Maputo Salvationists, joy in the knowledge that though their country remained poor, they could worship openly, fly their flags, beat their drums, wear their uniforms and proclaim to all that they were Salvationists. The long hard fought battle was over. The Salvation Army in Mozambique has continued to flourish and grow and in 2008 the work in the country was separated from the Southern Africa Territory and the Mozambique Command came into being. To God Be All The Glory! Don't forget. Recorded in 1910 by General Booth. 1 am glad you are enjoying yourself The salvation business is a friend of happiness. Making heaven on earth is our business. Serve the Lord with gladness is one of our favourite mottos. So I am pleased that you are pleased! But amidst all your joys don't forget the sons and daughters of misery. Do you ever visit them? Come away and let us make a call or two. Here is a home, six in family, they eat and drink and sleep and sick and die in the same chamber. Here is a drunkard hovel, void of furniture, wife a skeleton, children in rags; father now sleeping, the victims of his neglect. Here are the unemployed, wandering about, seeking work and finding none. Yonder are the wretched criminals cradled in crime passing in and out of the prisons all the time. There is the Daughter of shame deceived and wronged and ruined. Travelling down the dark and blind to an early grave. There are the children, fighting in the gutter, going hungry to school. Growing up to fill their parents places. Brought it all on themselves, you say? Perhaps so. But that does not excuse our assisting them You don't demand a certificate of virtue before you drag some drowning creature out of the water. Nor the assurance in a man of faded grace before you deliver him from the burning building. But what shall we do? Content ourselves by singing a hymn? Offering a prayer? Or giving a little good advice? NO! Ten thousand times no! We will forgive them. Feed them! Reclaim them. Employ them! Perhaps we shall fail with many. Quite likely. But our business is to help them all the same. And that in the most practical, economical and Christ-like manner. So let us hasten to the rescue for the sake of our own peace, the poor wretches themselves, of these children, and the Saviour of us all. But you must help with the means. And there is nothing like the present. Who in this company will lend a hand by taking up the gauntlet? They say we go too fast! This accusation comes from all directions. Our enemies do not like our speed and our friends are afraid of it. What do they mean? If they had complained that we did not go fast enough, I could understand them. If our enemies had argued that after all we say about the evils of sin, the terrors of the Judgment Day, and the damnation of hell, we do not believe in these things ourselves, I could understand that, and feel humbled under their indictment. If our friends came together and said, 'Why don't you increase the speed? Look at the dying millions at home and abroad. You have evidently got a wonderful way of reaching the masses. You have accomplished what no other organization has. You can adapt yourselves to all peoples and countries and climates. Why don't you push on faster? Why don't you train more cadets-send out more officers-hunt up more criminals, drunkards and fallen women? Go faster; get up more steam!" Now, this seems to me would be the natural way of talking for both foes and friends. But no! The cry is not "Go faster' but "You go too fast!" What do they mean? Speed is a good thing, and, if combined with safety, the faster the better. It is reckoned good in traveling. 1 don't know of any train that goes fast enough for me. Time is so precious that unless it can be spent in sleeping or working, every minute of it is begrudged. My feeling whenever I am in a train is, "Now, engine driver, do your best, and fly away! " Speed is reckoned a good thing in money-making. Who would complain if we were an Investment Company developing a profitable gold mine? The same people who complain of our speed in spreading salvation and saving men would all want to buy shares, become our partners or buy us out. If we were a killing army, no one would complain of our going too fast on the line of victory, slaughtering Arabs, or Afghans, or Zulus, or anybody else who did not live on our side of the sea. If we killed plenty of them, burnt plenty of houses, took plenty of spoil, we should fascinate the world again as Napoleon did with the speed of his successes. Painters and poets and newspapermen would fill the whole earth with our fame. But because God has given us a little success in saving men and women from endless damnation, and extending the Kingdom of Jesus Christ, there is a great outcry especially from those who every morning pray "Thy Kingdom come!" -that we are going too fast; they say we are ambitious and seeking great things. Can we go too fast, my comrades in saving souls? I will not attempt to answer that question. No soldier in the Salvation Army would ask such a question. It is an insult to the Bible-to the teachers of Christianity. I refuse to reply to it. If anyone still wants a reply, let him ask the lost souls in Hell whose brothers and sisters are following them there. Let him go and ask the blood-washed throng in Heaven, whose eyes are wide open at last to the value of salvation. Let him anticipate the Judgment Day, and in spirit stand before the Throne and propose, if he dares, the question to God Almighty. I think from Hell, Heaven and the Great White Throne, the answer would come back, "More speed! Go faster!" If it should entail the stopping of legislature, pleasure, business, and all the employments and occupations of time, push forwards! Hurry onwards! Save the world! Some warn us, "but there is danger with great speed". Perhaps there is, but that is not certain; and even if so, I refuse to abate the speed to avoid the risk. If this thing is worth doing, let us do it with all our might. They say, "but if you go on at this pace a smash will come". Well, perhaps it will. Perhaps God will let the devil and those who help him smash The Salvation. Army. They smashed Jesus Christ. There were slanders and riots and injuries terminating with the Crucifixion. Then a great number looked on and said, 1 told you so!" If they smash The Salvation Army, there will also be a great number looking on and telling them to do it, and saying the same thing. However, there are no evident signs of this terrible danger. For twenty years we have gone on paying our debts, breaking up and taking possession of new ground, and holding it when occupied; and, thank God! We are more closely bound together-more wrapped up in the spirit of sympathy and unity today than ever we were before. Is our speed really too great after all? Is not all this talk a delusion? Speed is a relative thing, and the accuracy of the estimate depends upon the standard you measure it by. The coach is a rapid vehicle compared with the old carrier's cart, but it is very slow when put alongside a royal express train. What do our objectors measure us by? Anyhow, I object to be measured by the standard of the carrier's cart. Does salvation travel as fast as sin? See how wickedness spreads. Talk about a prairie fire - it devours everything before it. Does Salvation keep pace with our ever-growing population? Make the calculation in your most favored Christian cities, and you will find we are terribly behind in the race. Do we keep pace with the devils in energy and untiring labour Do we go as fast as death? Oh, say no more! We'll close our ears to this cold, unfeeling, stony-hearted utterance of unbelief. LET US GO FASTER! We must increase the speed if we are to keep pace with the yearnings of the Almighty Heart of Love that would have all men to be saved. We must go faster if we are to have a hand in the fulfillment of the prophecies. Read the sixtieth chapter of Isaiah, and think of the speed that must be reached before all that comes true. We must go faster if we would wipe out the reproach and taunts of the mocking infidels who are ever asking for living proof of God's existence. We must increase our pace before our own prayers are answered, our own expectations realized, our own relations converted, and our own consistency proved. My comrades, the General issues the command to every country, and to every division, and to every corps, and to every soldier-to advance. The pace of the past is to be no standard for the future. We must go faster. Obstacles, difficulties, and enemies shall be swept before us, and the mouths of those who condemn us shall be forever stopped before the Lord. It was with great excitement that the Association learnt of two new stamp issues this year. As each was announced, news travelled rapidly around the world and the SAPHA received several calls and emails. We have pleasure in illustrating the design here. 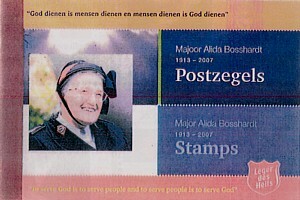 Nine postage stamps, each worth 44 euros, were produced in The Netherlands to celebrate the life of one of the country's the country's best-loved citizens — Lieut-Colonel Alida M. Bosshardt OF. The colonel, perhaps best regarded for her work in Amsterdam's red light district, was promoted to Glory in June 2007 after a lifetime serving the poor and needy. The nine stamps, each worth 44 eurocents, feature a variety of photographs or illustrations of 'De Majoor' (as she was known - even after promotion to lieut-colonel, in her famous Salvation Army bonnet. A special booklet was produced by Royal TNT Post, the main mail delivery service in The Netherlands. In it are the nine stamps plus many more photographs of the Colonel through the years. A biography of the colonel is included in Dutch and English and makes it very clear that her inspiration to work with the poor and dispossessed came from her love of God. The front cover includes — again in two languages — the motto by which. De Majoor led her life: 'To serve God is to serve people and to serve people is to serve God'. One hundred years ago this month (October 1908), Colonel and Mrs Robert and Annie Hoggard arrived in Seoul from England to 'open fire' for the Salvation Army. Throughout the intervening century with its wars and occupations, the Salvation Army has sought to bring relief and aid to the people. To commemorate the centenary, a special logo has been devised, with the English translation of the territorial motto based on Romans 16:13: 'Filling the land with God's hope'. A number of events have been taking place to mark the centenary and the Government of the Republic of Korea has given approval for a special postage stamp to be issued in celebration of the Salvation Army centenary. Such approvals are rare, especially for a religious group or body. It is with pleasure that we illustrate the stamp. Salvation Army History Books, we all have them on our shelves. As all of my packages are sent to me at Territorial Headquarters, I think I must drive my office colleagues mad sometimes with this particular passion, particularly when I have for me at least an exciting new acquisition. 1 will to the best of my limited ability endeavour to give an outline of books published on the history of The Salvation Army. It would seem that for a long time period there were very few books on the subject, but more recent years has seen a veritable explosion of new works. Between the years 1883-1885 The Salvation Army published 'The Salvation War' a precursor to the Year Book that we all know and love. These contain contemporary accounts of The Salvation Army's spectacular progress at home and abroad at that time. I have to state at this point that I would not be without my copy of the Year Book as very often it gives a good starting point for any queries that may arise. 1 will begin with the Biographies of William and Catherine Booth, the official biography of Catherine Booth was written by her son in law - Frederick Booth-Tucker and published in 1892. W.T. Stead also wrote Catherine's biography which was published in 1900. Catherine Booth has actually had very little written about her since that time. The only other books that I can find are a volume of The Warriors Library written by Mildred Duff in 1914, Metcalfe 1967,1980, the 1970 biography written by Catherine Bramwell Booth which is without doubt a very difficult book to read, Charles Ludwig's 'Mother Of An Army' in 1987 and Roger Green's 1996 biography. William Booth had his biography written more than once even before his Promotion to Glory. There has been something in the region of twenty biographies, these include: Booth Tucker 1898, Page 1901, Railton 1912, Begbie 1920, Nelson 1929, St John Ervine 1932, Carpenter 1944, Steele 1954, Taylor 1963, Bishop 1964, Collier 1965, Barties 1975, Vaisey, Benge, Hosier, Hattersley 1999, Bennett, Green 2006. There are of course some booklets in the Liberty Books and Victory Books Series. There is also Moyles' book published in 2006 - William Booth In Canada, which deals with the visits William Booth made to the that country. The Booth funily have not fared too well as far as biographies are concerned, Bramwell Booth 1932 written by his daughter Catherine; Evangeline Booth - Wilson 1935, Lavine 1970, Troutt 1980. Two on Catherine - The Marechale: Strachan 1920's, The Heavenly Witch: Scott 1981; The Consul (Enuna) - Frederick Booth Tucker 1903; Herbert, Ballington and Lucy - there appears to be nothing, Marian Carpenter 1921. Early Salvation Army Leaders have not fared too well either - Dowdle 1901; Railton - Duff 1920, Watson 1970, Chase 1995; Cadman - Wallis 1928; Lawley - Carpenter 1924; Booth-Tucker - Williams 1980; Jeffries - Claughton 1946. It is now long overdue for new biographies of these greats to be written as so many Salvationists are totally ignorant of the contribution made by them and they are written for a completely different era. More recent works are those on Yarnamuro - Rightmire 1997; Brengle - Rightmire 2003, the previous full biography being Halls in 1933. Over the years there has also been a large number of biographies (mainly in booklet form) written of other leaders and notable officers but these are two numerous to deal with here; 1 personally would love to see a full length biography of Colonel William Pearson and Eliza Shirley amongst others though there are mini-biographies of many of these early personalities. One very notable publication is Yin - The Mountain The Wind Blew Here - Brown 1988. Biographies of Army leaders are a very useful source of information, particularly the Generals as they often give an insight to happenings behind significant events, amongst these are - Storm Pilot (Higgins), Evangeline Booth - see above; A Man Of Peace In A World At War (Carpenter); A Very Private General (Coutts); The Ninth General (Wickberg); General of God's Army (Burrows); If Two Shall Agree (Rader). There are also autobiographies - should that not ought to be biographies - that have been published over the years, amongst these being - The House Of my Pilgrimage (Osbom); A Goodly Heritage (Kitching); A Burning In My Bones (Wiseman); There's A Boy Here (Gowans). 1 have to confess I have a problem with anything autobiographical as it seems to me that the writers are on some kind of ego trip, and that these writings in reality contribute very little of real worth. The origins of The Salvation Army is a fascinating area of study, but surprisingly little has been published on this particular subject, with only Glenn Horridge - The Salvation Army - Origins and Early Days 1993; Norman Murdoch - Origins Of The Salvation Army 1994; and Parnela Walker - Pulling The Devils Kingdom Down 2001. The now eight volume official history is of course necessary reading, but it should be noted that this is an official history and always shows the movement in the best possible light. I have my doubts about whether volumes 7 and 8 should have been written so early as almost everything they contain is within living memory, and some of the events described particularly in Volume 8 differ from my memory and the memories of others 1 have spoken too. It would perhaps have been better if these last two volumes had been kept back for a few years more. Dates of publication are Volume 1 1947, Volume 2 1950, Volume 3 1955 author Sandall, Volume 4 1964, Volume 5 1968 author Wiggins, Volume 6 1973, Volume 7 1986 author Coutts, Volume 8 2000 author Gariepy. Also very valuable are the history of The Salvation Army in various countries, and parts of a country with many of these being written for centenaries. Countries: United States - Mackinley - Marching To Glory 1980 2nd edition expanded 1992, other books on The Salvation Army in the United States are The Hallelujah Army - Neal 1961, Soldiers Without Swords - Wisbey 1955, Born To Battle - Chesham. 1965; South Africa - Tuck - Salvation Safari 1983; Canada - Collins - The Holy War Of Sally Ann 1982, other books on the history of the Salvation Army in Canada are Brown - What God Hath Wrought 1952, Moyles - The Blood And Fire In Canada 1977; Australia - Bolton - Booth's Drum 1980, Salvos With the Forces - Red Shield Services in ~I - Hull 1995, Salvo The Salvation Army in The 1990's - Cleary, New Zealand - Bradwell - Fight The Good Fight 1982; India, Pakistan, Bangladesh, Burma, Sri Lanka - By Love Compelled - Smith 1981, also of interest is Muktifauj Forty Years In India - Booth-Tucker 1922; Caribbean - Hobbs - Jewels Of the Caribbean 1987; Mozambique - The Song Of The Unsung Heroes - Dunwoodie 1994, Indonesia - History Of The Salvation Army in Indonesia Volume 1 - Brotiwer 1996; Zimbabwe - A Flame Of Sacred Love (S.A. in Zimbabwe 1890-1991) Nyandoro 1993; Mexico - Salvation Patrol - Gearing 1981; Singapore - By Love Compelled 60th Anniversary - Wong 1995; China - A Costly Death Bed Charge Cairns 1989 and Good Morning China - Yee 2005. Parts of Countries - Scotland Marching As To War - McLean 1979; Sweeping Through The Land - A History of The Salvation Army in the Southern United States - Satterlee 1989; Texas-Lone Star Legacy 1989 (Mainly Photographs); Utah 100 Years Of Service - Fritz 1989; Alaska - A Century of Service in Alaska - Gariepy 1998; The Salvation Army In Newfoundland - Moyles 1997. Of particular interest is We Have Returried-The Salvation Army In Uganda 1980-1985 - Millar 2003; Red Hot and Righteous Winston 1999 and Hallelujah Lads & Lasses-Remaking the Salvation Army in America 1880-1930 - Taiz 2001. Though many of these are again usually 'official histories' they do contain a good deal of information about the spread of The Salvation Army around the world. Some non-English speaking territories have also produced histories but I am unable to cover them in this article, these include Sweden and Germany. There has for some reason no definitive History of The Salvation Army Social Work ever been written. There has though been many books written amongst these are The Poor and the Land 1905 and Redemption 1910 - H Rider Haggard, The History Of The Salvation Army Volume 3 - Robert Sandall 1955, Bread For My NeighbourThe Social Influence Of Williarn Booth - Coutts 1978, Booth's Boots-Social Service Beginnings in The Salvation Army - Fairbank 1983, Somebodys Brother - McKinley 1986 which deals with the Men's Social Service Dept in the United States 1891-1985. Perhaps unique is Happy Warriors the Story Of The Social Work Of The Salvation Army - Search 1956, but the book only deals with some aspects of the Womens Social Work in the United Kingdom. Of great interest are The Salvation Army Farm Colonies - Spence 1985, Southern - Soap-Soup-Salvation - A Compendium of Salvation Army Social Services in the Australia Southern Territory - Kirkham/Cox 2003. From Canada there is Eighty Years of Grace Wagner 1970, this volume deals with the history of the Grace Hospitals in Canada. There is also Green's - War On Two Fronts- The Redemptive Theology Of Williarn Booth, 1989 which deals with William, Booth's thinking in regard to Social Work and Reform, also I will include here What Price the Poor?-William Booth, Karl Marx and the London Residuum Woodall 2005. Nothing except the three following seems to have been written concerning the various aspects of Salvation Army Work - Missing - Williams 1969 and God's Private Eye - Pratt 1988 - both of these deal with missing persons work, and The Falling Leaf - Smith 2004 - which tells of The Salvation Army's involvement in ministering to those who are H.I.V. positive and their families. I am including a new publication - Soldiers Of The Cross - Murdoch - in this section as it is the biographies of two pioneers of social change - Susie Swift and David Larnb, this books gives due credit to two unsung heroes of The Salvation Army's early days in social reform. Corps Histories - I only know of very few of these and they have all been produced for the Corps Centenaries; these are Sheffield Citadel, Croydon Citadel, Portland, Felixstowe, Newbury Park, Exeter Temple, Leigh on Sea; Chelmsford (though this is an account of the first year in Chelmsford as seen through the various newspaper reports). There may be others that have been produced in other Salvation Army Territories - Australia Eastern Territory seems to have produced quite a number including histories of Broken Hill Corps; Wollongong Corps, Brisbane City Temple and Toowoomba, Corps (I have a complete list but there are far too many to list here). From the United States I have heard of only three; Greenville Corps; South Carolina Kitchen; Cap'n Tom -The Story of one man's victory over alcoholism and his ministry on the Street of Lost Hope - Troutt (This is also the story of the Harbor Light Corps m Chicago and Detroit). I am not sure if this book is actually a history of the Corps but - For My Kinsmen's Sake - Check Hung Yee (A Salvation Army Officer's quarter century of service in San Francisco Chinatown) would appear to be a very interesting read. From New Zealand there is again quite a number of full works including Linwood Corps; Christchurch Corps and Invergargill Corps. (Again there are too many to list here, but I do have a full list). From Canada I can only find two The History of St John's 1 and 2 Corps, Newfoundland; and Edmonton Corps Moyles. I would be interested in hearing of others, it must also be remembered that many corps have produced booklets etc for centenaries but these are far too numerous to list. The first High Council fascinates many people and Kirkhain's book - Deposed But Not Despised is excellent. Others include Allighan's - Four Bonnets To Golgotha and Lunn's - Salvation Dynasty. Both of these are perhaps a little on the sensational side but I found them to be a fascinating read along with 'The Clash Of The Cymbals' This subject is also covered at some detail in St. John Ervine's second volume of his biography of William Booth though where he obtained his information is perhaps best left to the imagination. Though there have been many incidents of many kinds in the history of The Salvation Army very few appear to have had any major works written about them. I can only find three major incidents that have been covered in any depth, these being the Maiden Tribute Campaign of 1885, the campaign to abolish Devils Island 1933-1952, and the Empress of Ireland 1914. The titles are Maiden Tribute - Unsworth 1954; The Conquest of Devils Island - Pean 1953 (1 believe there are at least two other books by the same author on this subject, but I have been unable to trace them); Till We Meet Again-The Sinking of the Empress of Ireland - Wood 1982, Losing The Empress - Creighton 2000. Having said this two authors at least have produced very interesting works which cover a variety of incidents from the fascinating history of the Salvation Army - The Salvation Army And The Public - Moyles 2000 and Turning Points-How The Salvation Army Found A Different Path - Satterlee 2004. Though women have played a major part in the history and the development of The Salvation Army ahnost nothing has been written about their specific contribution - all I have been able to find is Heart of the Family - A History of the Home League in the British Territory - Burrows 1989. A fascinating book on this topic is Women In God's Army-Gender and Equality in the Early Salvation Army - Eason 2003, both of these books being written by men. One fascinating book is Bernard Watson's 'A Unique Society - A History of The Salvation Army Assurance Society Limited' 1968. This book gives a detailed history of a unique branch of Salvation Army work. Published to commemorate the Centenary of The Salvation Army in 1965 is 'A Hundred Years War' Written by Bernard Watson, whilst this book does contain some anecdotal history, it is in many ways more of are view of Salvation Army work in the mid 1960's. It is still a good read. It would seem that since the late 1950's numerous novels have been written that are set in a Salvation Army context e.g. Shout Aloud Salvation - Terrant, Strawberry Fields - Flynn. Some of these are an interesting diversion but there is no way they can be regarded as serious historical works though they may give some background. On the subject of Salvation Army music there appears to have been very little written at least in book form. The only books 1 can find are Play The Music Play - Boon 1966, Sing The Happy Song - Boon 1978, I.S.B. - Boon 1985. From Australia there is Pressing Onward: the first one hundred years of the Melbourne Staff Band - Peeke 1986, and Brave and True - Cox 2003 and from the United States there is Heralds of Victory/New York Staff Band - Holz 1987. There is also a new publication that was due to be published this year but to date it has not made an appearance - Brass Bands Of The Salvation Army - 2006. 1 have only found one (though I am informed that there are several others, 1 do not have the details) concerning the history of a Corps Band - The Band With A Name-A History Of Coventry City Salvation Army Band from 1892-1993 - Elliott 1994. There are also a number of biographers of various Salvation Army Musicians - In The Firing Line (Coles) W. Court 2006 is the latest. Others include Father of Salvation Army Music (Slater) A. Wiggins 1943, Triumph Of Faith (Marshall) A. Wiggins 1958, Symphony Of Thanksgiving (Goffin) C. Bradwell 1994. There was a new departure in July 2006 with the publication of A Historical Dictionary Of The Salvation Army - Merritt. This is an encyclopaedic work covering most of what some would call Salvation Army trivia. This book falls into a category of its own and one can only hope that it will be regularly updated, and that some kind of supplement will be made available. Editorial Note: Advice on obtaining any of these books or on any book connected to the Salvation Army can be freely obtained by e-mailing or writing to the Editor (we have managed to locate most books previously requested and are happy to offer a free book search). We are also aware of other publications due next year, in particular Ken Elliott's story of Eliza Shirley. In Australia, Garth Hentzschel's 'Cross and Crown Publications' is producing classic Army reprints as well as new books and we are happy to provide lists of his publications on request.